Gorillas have been seen for the first time using simple tools to perform tasks in the wild, researchers say. Scientists observed gorillas in a remote Congolese forest using sticks to test the depth of muddy water and to cross swampy areas. Wild chimps and orangutans also use tools, suggesting that the origins of tool use may predate the evolutionary split between apes and humans. Gorillas are endangered, with some populations numbered in the hundreds. "We've been observing gorillas for 10 years here, and we have two cases of them using detached objects as tools," said Thomas Breuer, from the Wildlife Conservation Society (WCS), who heads the study team in Nouabalé-Ndoki National Park in the Republic of Congo. "In the first case, we had a female crossing a pool; and this female has crossed this pool by using a detached stick and testing the water depth, and trying to use it as a walking stick," he told the BBC. 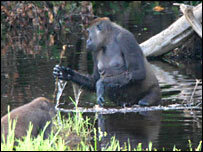 The second case saw another female gorilla pick up the trunk of a dead shrub and use it to lean on while dredging for food in a swamp. She then placed the trunk down on the swampy ground and used it as a bridge. "What's fascinating about these observations is the similarity between what these creatures have done, and what we do in the context of crossing a pond," observed Dr Breuer. "The most astonishing thing is that we have observed them using tools not for obtaining food, but for postural support." This discovery makes the gorilla the last of the great apes to be documented using tools in the wild. Chimpanzees use stone tools to process food, and their close relatives bonobos will use the mashed ends of sticks to soak up liquids. Orangutans - the only Asian great ape - use branches to forage for food, and leaves to modify their calls. Though some monkeys and birds also use tools, Thomas Breuer believes that the great apes are special. "We have now seen tool use in all the great apes in the wild," he said. "That now makes us think that it might be the case that tool use has been an ancient trait of all great apes before the human lineage split away." Current scientific orthodoxy holds that the separation between the chimpanzee and human lines came about six million years ago. 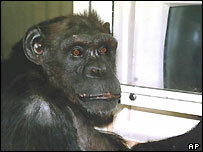 Research has shown that in captivity, apes can learn a range of skills including number and character recognition. They can also learn tool use and transmit their acquired skills to other members of their social group. The Congo team, drawn from the WCS and the Max-Planck Institute for Evolutionary Anthropology in Leipzig, Germany, believes that the tool traits they have observed in the wild may also be shared and learned across gorilla social groups. They publish their findings in the online journal Public Library of Science Biology.